There are few dishes as satisfying as pasta on a cold Winter’s night. 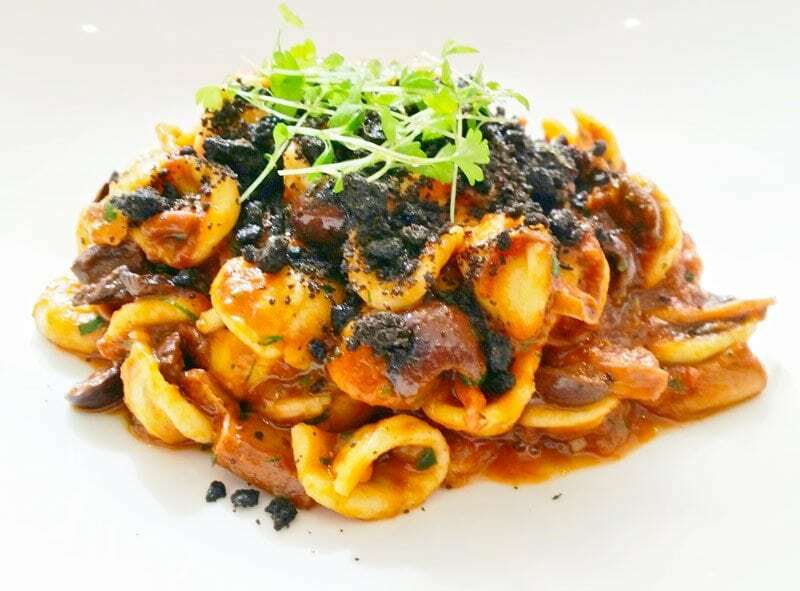 This Hand Rolled Orecchiette, Slow Cooked Calamari, Tomato, Lemon, Parsley and Squid Ink Pangrattato is rich and hearty. Try this one at home for a fancy night in! 1. Start with the squid by removing wings and tentacles. Wash out the inside of the tube with cold water. Slice squid to roughly 1cm wide pieces about the length of your finger. Same with the tentacles. Put aside. 2. Add 3 tbsp olive oil to a heavy based pot and sauté off onion, garlic, celery, fennel, capers, anchovies and fennel seeds. When just cooked add white wine and saffron threads, reduce till most of wine has gone. Add the prepped squid and tinned tomato. Bring to boil, turn down to a slow simmer and stir regularly as it cooks which should be 3-4 hours. 3. To make the pangrattato, tear squid ink bread into rough pieces and place onto an oven tray with parmesan, butter and 1 tbsp of olive oil, toss together and bake in oven at 150°C until completely dry, approximately 30mins. When cool, break pieces into a coarse breadcrumb size and put aside. 4. When squid is tender your sauce is ready. To finish the sauce off, add seasoning, butter, olives and chopped parsley, then add cooked pasta. Serve into bowls and top with panagrattato and freshly grated lemon zest.